Hey all! Just in case you missed it, I did actually post yesterday - I know posting two days in a row is just crazy for me right now! 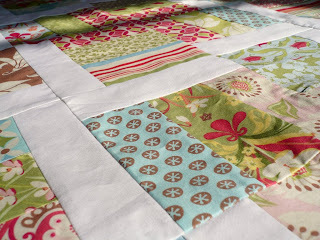 You can find yesterday's post with a new quilt sneak peak here. So, first up we have the winner of the giveaway! Drum roll please...the winner of the giveaway is the lovely and talented Lolly! Woohoo, I'll be sending the notebook and your embellishments along soon - I kinda wish I had made a teal notebook now! And now, for the infamous apricot scone recipe! I decided to make this recipe a little more interesting, so when I got home tonight I whipped up a batch and took pictures along the way. Are you ready for this? It's gonna be fun! -Mix flour, baking powder, and baking soda in large bowl. -Add sugar and apricots and mix well. 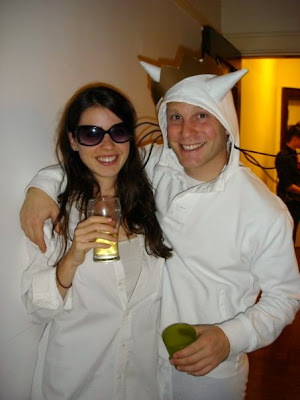 -In a small bowl whisk together the egg and half-and half. Pour into dry ingredients and stir until just blended. -At this point you can do one of two things: You can turn your batter out onto a floured surface, knead 8-10 times, and shape into a flattened round. Place the round onto a baking sheet, score into 12 pieces and bake. Or you can do as I do...it's really not laziness or anything, but I actually prefer drop scones to formed wedge ones. I like the rustic nature of them and how they have even more little nooks and crannies for anything you might want to put on them. So here's what I do after I pour the wet into the dry ingredients: I get into the bowl with my hands and mix everything together that way (thus making sure everything is nicely blended, but also getting a little kneading in), then I add just a few drops of water to the batter to take the texture from a smooth dough to a bit-sticky. I then use a spoon to "drop" the dough onto the baking sheet (I can usually get 18-20 drop scones out of this recipe - they're not as small as they look in this picture, this is just one big baking sheet!). -Bake for 12-15 minutes or until lightly browned - always be sure to test with a toothpick! Let cool, so as not to burn your little fingers, but trust me these are really good warm! I lost the light just as I went to take this last shot, but may I suggest you try a little Bonne Maman with your scones? And no, those are not giant scones, that is just one teeny jar of Bonne Maman! Enjoy everybody and let me know what you think! I'm going to try substituting the apricots for dried mango soon, keep your fingers crossed! Okay, so here's the background on my first little tutorial. A few months ago I was looking for a graph paper notebook to carry around with me when working on quilt designs, but could not find them anywhere (even though I've seen them before). I ended up buying just a notepad of graph paper, but find it difficult to carry around in my bag since it doesn't have covers and the pages end up getting caught, scrunched, and torn because of everything else in my purse. It's also a bit big to be carrying around in my purse - although if you've seen my purse, you wouldn't think this was an issue - so I decided to make my own! These notebooks are great for any kind of design work where you might want to some sort of dimensional reference, I also thought they could be neat for kids for math homework (I always liked doing math on graph paper) or for drawing. Really, these could be fun for just about anything - the possibilities are endless! -Take your 10 sheets of graph paper, with the graph side facing up, and fold them in half. Use your bone folder to get a nice crisp edge. -Do the same with your piece of card stock. 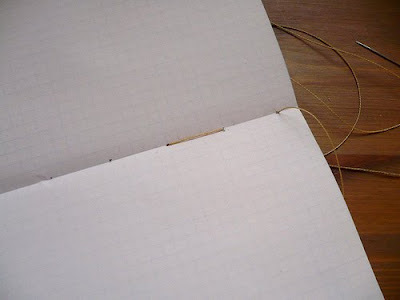 -Open up your graph paper to the centre and, using your pencil, mark seven dots along the crease. Since the graph paper is basically see-through, I used the blocks of the graph paper as my markers. I marked two blocks up from the bottom and then marked every 5 blocks until I was left with two at the top again (see picture for explanation and ignore the one little dot that didn't erase all the way). -Insert your graph paper booklet inside of the folded card stock cover and use your paperclips at each corner to secure everything in place. -Using your needle (without thread) punch through the dots you made so that the needle comes out on the card stock side. Punching the holes through first will help when you go to sew the binding. -Insert your threaded needle into the first bottom hole from the inside (i.e. graph paper side, not card stock side), leave a short tail (about 2-3") for tying off at the end. -From the card stock side of the booklet, insert your needle into the next hole up and pull through. You're basically going to be doing a running stitch here. Continue this until you reach the top hole. -When you reach the top hole, pull the needle through to the card stock side. 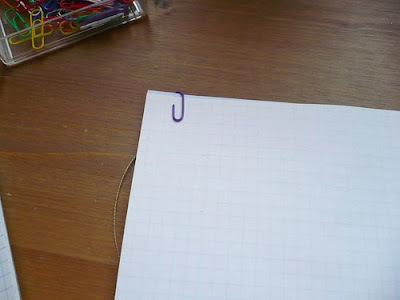 -Take your thread and wrap it around the top of the booklet so that it lies flat against the spine and comes over to the graph paper side of your booklet. Insert the needle back into the top hole so that it comes out on the card stock side. -Here's what it looks like once the needle has been pulled all the way through to the card stock side. -Insert needle into next hole down and continue until you reach the bottom hole. Doing this "double-running stitch" (that's what I call it) will insure that all spaces on both the spine and inner crease are covered. -When you reach the bottom hole do just the same thing that you did with the top hole (except that you are going from the graph paper side to the card stock side and back to the graph paper side). Pull both threads (your starting tail and the end tail) down to the bottom and tie them against the bottom of the booklet (I used about four knots, teehee). -Your little booklet is now done! -Embellish the booklet in anyway you choose! -You'll notice when you open your booklet that for the first half of the book, you have graph paper on the right hand side and blank paper on the left hand side. The centre will be two blank pages. I find these blank pages good for making notes, or gluing small pieces of fabric into the booklet. Also, you'll notice that after the centre crease, the graph paper is on the left hand side and the blank paper is on the right. You can either now design on the left hand side, or do as I did and flip the book once you get to the half of the book so that the graph paper is on the right again. -I didn't really embellish the other side that much, but here ya go! Now for the giveaway! I am giving away one of these handmade booklets, as well as some embellishments (patterned papers[including some Amy Butler], embroidery floss, ribbon, etc. ), covered paperclips, and waxed macramé thread so that you can make your own! Since graph paper, regular card stock, and needles are pretty easy to some by, I am not including those things. This notebook actually has a slate sticker on the front, and you can use chalk to write on it (wipes off with a damp sponge). I only embellished the notebook on one side, so you can embellish the other if you'd like! Leave one comment to enter the giveaway. 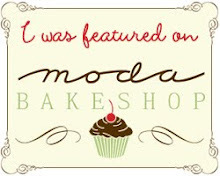 If you are a follower of my blog (or if you become one) leave a second comment and you will get a second entry! 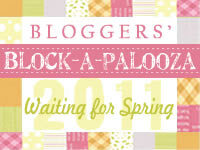 The giveaway is open internationally and is open for one week. Yay! If you have questions about my tutorial, please feel free to ask. Also, any constructive criticism is welcome as this is the first tutorial I've ever written! 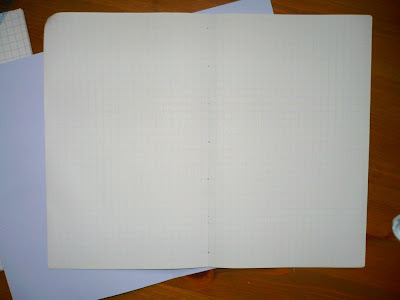 And, if you'd like, send me a picture of your completed notebook made using this tutorial and I'll post it on the blog. Thanks everyone! 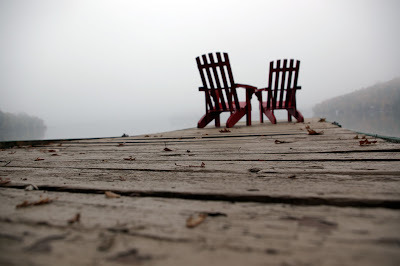 Misty Muskoka, originally uploaded by Cathlin B. Do you have anything to add or a list of things to share?